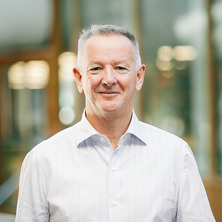 Prof. Cresswell’s research interest is in the integration of neurophysiology and biomechanics (neuromechanics) to investigate the control of human movement. Particular research interests lie within the areas of: Motoneurone, reflex and cortical excitability during lengthening and shortening muscle actions; Neuromuscular fatigue; Reflex and voluntary activation of the abdominal musculature during controlled postural tasks. Dr Cresswell completed his medical doctorate in Neuroscience from the Karolinska Institute, Sweden, in 1993. He remained at the Karolinska Institute and University College of Physical Education and Sports until 2005 when he joined the academic staff at the University of Queensland with joint appointments in the Schools of Human Movement Studies and Health and Rehabilitation Sciences. Dr Cresswell is the Head of the School of Human Movement and Nutrition Sciences. Prof. Cresswell's research interest is in the integration of neurophysiology and biomechanics (neuromechanics) to investigate the control of human movement. Particular research interests lie within the areas of: Neural control of voluntary muscle actions; Neuromuscular fatigue; Muscle mechanics, Gait and Posture. Racinais, Sebastien and Cresswell, Andrew (2014) Temperature affects maximum H-reflex amplitude but not homosynaptic postactivation depression. The FASEB Journal, 28 S1: . Technical or physiological limitations to the interpolated twitch technique? Cresswell, AG and Ovendal, AH (2002) Muscle activation and torque development during maximal unilateral and bilateral isokinetic knee extensions. Journal of Sports Medicine And Physical Fitness, 42 1: 19-25. Loscher W.N., Cresswell A.G. and Thorstensson A. (1996) Central fatigue during a long-lasting submaximal contraction of the triceps surae. Experimental Brain Research, 108 2: 305-314. Loscher W.N., Cresswell A.G. and Thorstensson A. (1996) Excitatory drive to the α-motoneuron pool during a fatiguing submaximal contraction in man. Journal of Physiology-London, 491 1: 271-280. Cresswell A.G., Blake P.L. and Thorstensson A. (1994) The effect of an abdominal muscle training program on intra-abdominal pressure. Scandinavian Journal of Rehabilitation Medicine, 26 2: 79-86. Cresswell Andrew G. and Thorstensson Alf (1989) Intra-abdominal pressure and patterns of abdominal muscle activation in isometric trunk flexion and extension. , 22 10: . Thorstensson Alf, Andersson Eva and Cresswell Andrew G. (1989) Lumbar spine and psoas muscle geometry revisited with magnetic resonance imaging. , 22 10: . Wood, G. A., Lockwood, R. J., Cresswell, A. G. and Henstridge, J. (1983) Motor unit activity and muscle strength development. Australasian Physical and Engineering Sciences in Medicine, 6 2: 71-75. Hahn, Daniel, Hoffman, Ben W., Carroll, Timothy J. and Cresswell, Andrew G. (2011). Neural control of eccentric and post-eccentric muscle actions. In: Veronique Feipel and Serge Van Sint Jan, ISB2011 Brussels. XXIIIrd Congress of the International Society of Biomechanics, Brussels, Belgium, (72-72). 3-7 July 2011. Hoffman, Ben, Oya, Tomomichi, Carroll, Tim and Cresswell, Andrew (2009). Changes in cortical and spinal responsiveness during a fatiguing submaximal contraction. In: Proceedings of the 7th Australasian Biomechanics Conference. ABC7 - 7th Australasian Biomechanics Conference, Gold Coast, (31). 30 November - 1 December, 2009. Cresswell, Andrew (2009). Motoneurone firing behaviour and reflex excitabiliity during the performance of controlled isometric contractions and other more functional motor tasks. In: Proceedings of the 7th Australasian Biomechanics Conference. ABC7 - 7th Australasian Biomechanics Conference, Gold Coast, Australia, (7-7). 30 November - 1 December, 2009. Cresswell, A.G., Carroll, T.J., Persson, J. and Selim, K. (2009). Reciprocal modulation of plantar flexor and dorsiflexor motor units during postural sway in quiet standing. In: 2009 Neuroscience Meeting Planner. Neuroscience 2009, Chicago, IL, (np). 17-21 October, 2009. Oya, T., Riek, S. and Cresswell, A.G. (2009). Recruitment and firing rates of soleus motor units under a possible influence of persistent inward currents. In: 2009 Neuroscience Meeting Planner. Neuroscience 2009, Chicago, IL, (np). 17-21 October, 2009. Oya, T. and Cresswell, A. (2007). Assessment of presynaptic inhibition and motoneurone excitability during ramp and hold contractions of the triceps surae. In: Ridding, M. and Gandevia, S., IBRO World Congress of Neuroscience Handbook and Abstracts. "Motor Control at the Top End" 2007 IBRO World Congress of Neuroscience Satellite Meeting, Darwin, (69). 18-21 July, 2007. Tokuno, C., Taube, W. and Cresswell, A. (2007). Modulation in corticospinal excitability during natural standing. In: Ridding, M. and Gandevia, S., IBRO World Congress of Neuroscience Handbook and Abstracts. "Motor Control at the Top End" 2007 IBRO World Congress of Neuroscience Satellite Meeting, Darwin, (68). 18-21 July, 2007. Oya, T. and Cresswell, A (2006). Absence of an increase in the soleus H-reflex with increasing voluntary drive during shortening contractions in man. In: S.F. Heinemann and R. Tanzi, 2006 Neuroscience Meeting Planner. , Atlanta, Georgia, (). 14-18 October, 2006. Sharman, M. J., Cresswell, A. and Riek, S. (2006). Enhancing evidence based practice of PNF stretching. In: CISC2006 Conference Organising Committee, 13th Commonwealth International Sport Conference Program and Abstracts. 13th Commonwealth International Sport Conference CISC2006, Melbourne, Vic, Australia, (204-204). 9-12 March, 2006. Cresswell, A (2006). General considerations for trunk stability in sports and exercise. In: A. Burnett, D. Bishop and A. Meade, Proceedings of the 2nd Australian Association for Exercise and Sports Science Conference. From Research to Practice II, Sydney, (18). 28 September - 1 October, 2006. Tokuno, C., Garland, S. J., Carpenter, M. G., Thorstensson, A. and Cresswell, A (2006). The effects of sway velocity on the triceps surae H-reflex during quiet standing. In: S. F. Heinemann and R. Tanzi, 2006 Neuroscience Meeting Planner. Society for Neuroscience Annual Meeting 2006, Atlanta, Georgia, (). 14-18 October, 2006. Tokuno, C. and Cresswell, A (2006). Variations in the soleus and gastrocnemius H-reflex during quiet standing may be explained by naturally occuring sway. In: P. Martin, Proceedings of the Australian Neurosicence Society 26th Annual Meeting. Australian Neurosicence Society 26th Annual Meeting, Sydney, Australia, (67-67). 31 January - 3 February, 2006. Tokuno, C. and Cresswell, A. (2005). Modulation of the H-reflex within naturally occurring sway during quiet standing. In: The Neuroscience of Human Movement in Health and Disease Programme and Abstracts. 2005 Special Group in Coaching Psychology 2nd Annual Conference, University College, London, (2P). 19-20 December, 2005. Hodges, P., Kaigle Holm, A., Holm, S., Ekstrom, L., Cresswell, A., Hansson, T. and Thorstensson, A. (2003). Intervertebral stiffness of the spine is increased by evoked contraction of transversus abdominis and the diaphragm: in vivo porcine studies. In: International Society of the Study of the Lumbar Spine. International Society of the Study of the Lumbar Spine, Vancouver, Canada, (53). 13-17 May, 2003. Hodges, P. W., Kaigle Holm, A., Holm, S., Ekstrom, L., Cresswell, A. G., Hansson, T. and Thorstensson, A. (2003). Posteroanterior stiffness of the lumbar spine is increased by contraction of transversus abdominis and the diaphragm: Porcine studies. In: 14th International Conference of the World Confederation for Physical Therapy: World Physical Therapy 2003, Barcelona, Spain, (). 7-12 June 2003. How do past actions and rewards bias goal directed movement?